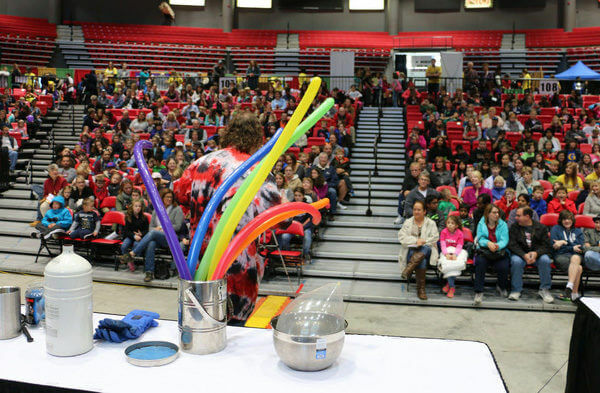 For the seventh consecutive year, NIU’s popular STEMfest will amaze and inform thousands of visitors of all ages at the Convocation Center from 10 a.m. to 5 p.m., Saturday, Oct. 8. This free, family-friendly festival, attended by nearly 7,500 people last year, showcases the fascinating power of the STEM fields (science, technology, engineering and math) through hundreds of hands-on activities, including cow eyeball dissection, fun-fly sticks and a telescope station. More than 200 exhibitors including NIU STEM departments, student groups, regional corporations, museums and national laboratories will offer learning games, interactive demonstrations, informative talks and even art projects, all designed to draw visitors into exploring STEM concepts and careers. As always, scouting groups and children will have plenty of opportunities to earn STEMfest patches by completing fun worksheets. This year, for the first time, STEMfest visitors will be able to observe how 3D printers are used to bring ideas to life. This exciting new option is made possible by Dremel 3D, which donated two printers to NIU’S STEM Outreach program earlier this year. Other new additions include a “superconducting levitation” display made possible by a grant from the DeKalb County Community Foundation, soldering stations set up by 2Dkits where students can create their own STEMFest pins, a virtual reality experience created by Zspace, and BLOCK Fest® for young children and their parents. Throughout the day the STEMfest Stage will host special presentations including a reading from The Toy and the Tide Pool, the second book in the STEM-themed Stuffed Bunny Science series written by Gillian King-Cargile of NIU’s P-20 Center. This adventure story introduces young readers to ocean animals, biodiversity and earth system science. Several of this year’s exhibits will be recurring STEMfest favorites, such as the Laser Lab, the Haunted Physics Lab and the STEM Read Book Fair. The Midwest Museum of Natural History will once again showcase its bone and fossil collection and creepy-crawly petting zoo. Argonne National Laboratory, NASA and Paradise Robotics also will host exhibits. Usborne Books will sell a large selection of STEM-themed books for young readers, with a portion of the proceeds supporting STEM Read’s year-round community programs. STEMfest sponsors include the DeKalb County Community Foundation, 3M, ComEd, Nicor, Ideal Industries, Traditional Medicinals, Dremel 3D, AptarGroup, and Ecolab. Media partners include Haunted Illinois and B95 WDKB-FM. This day of community learning, hosted by NIU STEAM Works, would not be possible without the hundreds of students, faculty and teacher volunteers who work with visitors to inspire today’s students to become tomorrow’s STEM innovators. For more information, contact Pettee Guerrero, 815-753-0533 or pguerrero1@niu.edu.